Corsa theme WON'T be updated and supported anymore. The main reason is that Corsa is not profitable. We (UpSolution team) recommend you to migrate your website from Corsa to Impreza. Why would I migrate my website to Impreza theme? IMPORTANT: make a full website backup. We recommend making a backup via your hosting panel. As a fallback option you can use some backup plugins, this article may be useful. Download our Migrator plugin and install it on your website (screenshot). Buy Impreza theme and install it on your website. Go to Impreza > About page and activate the theme via a relevant button, approve synchronization with this Support Portal. Go to Impreza > Addons page and install WPBakery Page Builder (formerly Visual Composer), Header Builder, Slider Revolution addons, they will be needed in migration. Go to Tools > Migrate Corsa to Impreza page (if you don't see this point in admin menu, you need to activate "UpSolution Corsa to Impreza Migrator" plugin on Plugins page) and you will see the yellow box (screenshot), just check the only checkbox and click Start the Migration button. Wait for the migration ending, when it is completed you will see the green box (screenshot). 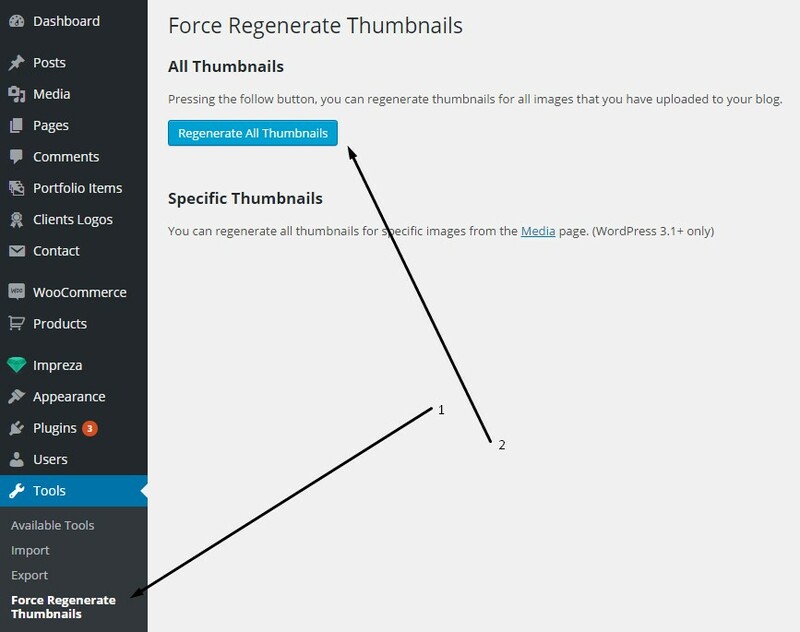 Install and activate Force Regenerate Thumbnails plugin (screenshot), then go to Tools > Force Regenerate Thumbnails and click the button (screenshot). It will regenerate thumbnails of all uploaded images and delete the extra ones. If you're using some cache plugins or CDN, clear all the website cache. When you complete the steps above — make sure that all of your website pages are displayed correctly and working as before. IF NOT please restore your website backup and turn back Corsa theme. That means you have some custom modifications, which are not compatible with Impreza. In this case, create a support ticket with the issue description. We'll review all the tickets and help you with the description of further steps, at the same time please note we won't fix the custom modifications manually. No, we can't. You need purchase Impreza theme separately via ThemeForest page only. After successful migration you'll be able to get a refund for Corsa theme, check the 4th question below. We can't, that's why we strongly recommend you make backup of your website BEFORE migration. Also, we recommend create a copy of your public website on a separate WordPress installation and try migration there first. We tested our Migrator plugin many times with real Corsa websites, it works just fine, if you didn't use strong customizations. We described the full process in our Migration Guide, it's very easy, just do step by step as described there. In case if you have some related issues you can create a support ticket. Yes, you can, but only after succesful migration to Impreza theme. In that case, use the Refund Request form, select your Corsa purchase, choose "I'm having a problem with item support" as the main reason and notify that you migrated to Impreza theme. After that, you'll get money back within a few days. 1. Can you exchange my Corsa theme to Impreza with a surcharge? 2. Can you guarantee that my website won't broke after migration? 3. Can you help me with migration my website to Impreza? 4. Can I get a refund (money back) for Corsa theme after migration?